I get asked this question all the time by professional photographers who are overwhelmed and confused by what they need to do in order for Google to list their websites in the search results. No doubt you’ve felt some of this same frustration after slaving for hours to create new content for your website, doing everything you thought was necessary, and then finding that Google simply ignores it, or ranks it at the bottom of page 19 where no one will ever see it. It’s no wonder, then, that people view SEO as something complicated or even mystical. But the truth is, SEO isn’t as mysterious as you might think. Sure, there’s a lot to it, and there’s no limit to how abstract or technical you can get with it if you want to (few photographers do!). The aim of this guide is to keep things simple, so there’s no need to get into all the intricate details of Google’s ranking algorithms in order to have a basic understanding of how SEO works. 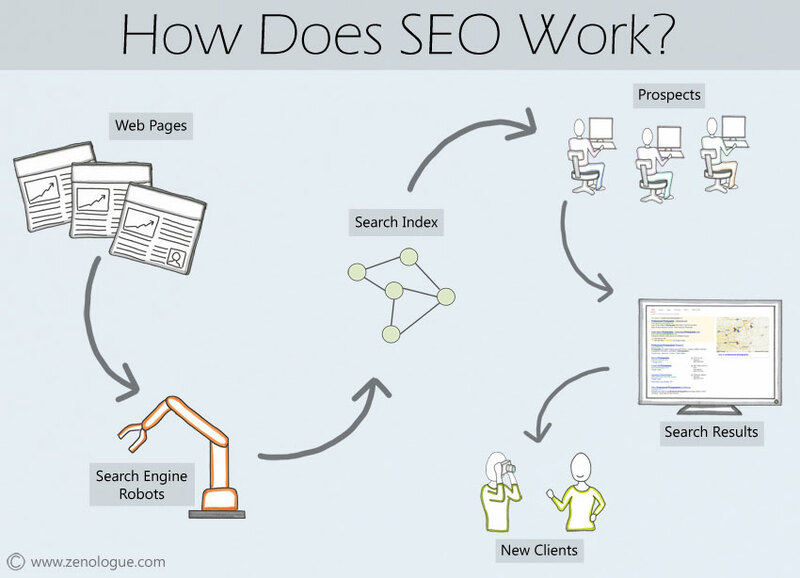 The diagram above shows the general flow of information with regard to SEO and how it leads from your web content to the ultimate goal of persuading new clients to hire you for their photography needs. Everything starts with your individual web pages. Together, the form the sum total of the actual content making up your photography website. We’ll get to the specifics of how to optimize your website content later on, but all you really need to know for now is that each and every page of your website counts as a distinct entity as far as Google and the other search engines are concerned. The search engines are not as interested with websites as a whole as much as the individual pages that make up those websites. Of course, it’s not quite as simple as that, but it’s a good enough viewpoint for our purposes. It’s therefore important to optimize each of the pages on your website individually, as well as considering the structure and intent of the website as a whole because the way your pages are connected through internal links gives Google a sense of how each page of content relates to the rest. It also follows that the more web pages you have, the better off you’ll be! This is one reason why Google loves blogs so much, since even a relatively small blog can have many separate pages within it when you count posts, pages, archives and other content. #2: Here Come The Robots! Before anyone can find you in the search results, the search engines need to be able to locate your website, either via links from other websites, or because you used a special file referred to as a sitemap to inform the search engine of your content directly. Regardless of how they find you, the search engine robots (often called web crawlers or spiders) collect every word of every page on your website, and follow any links they encounter to discover as much of your content as possible. It’s important to realize here that the search engine robots are essentially restricted to reading text – they’re unable to see inside images, for example, hence the reason why supporting “alt” text is so important for the images on a web page. Not only are they building a library of your content, they’re also creating a virtual map of what your website looks like from a topographical viewpoint. The main job of the search engine robots is to report back what they find to the main search engine index, where the data is then analyzed in great detail and combined with all the other information they already have about your website, together with the links pointing to it from other locations around the web. Once the search engine has processed the data from your web pages through its ranking algorithms, it has a good idea what the main keywords are on each of your pages, how relevant those pages are in relation to similar pages from other websites, and how much authority it should assign to your pages. The authority (or relative importance if you like) of your web pages is determined by feeding hundreds of different metrics and pieces of data into the ranking algorithm. Some metrics, such as the quality of external links pointing to you, have a high influence and are called the major ranking factors. Others, such as the text in your meta description might have a smaller effect, so we call those the minor factors. The search index acts pretty much like the index of a library, except that the Google “librarian” has actually read every book in the index and therefore has some notion of the relative importance or authority of each book. #4: Who Knows A Good Photographer? Back in the real world, your prospects and potential clients are out there looking for a photographer for their project, be it a wedding, commercial assignment, family portrait, or fine art piece. If they don’t already know a good photographer they can trust they’re highly likely to head off to their favorite search engine in search of someone they can check out and hire. This is where they’ll be typing the keywords for their specific search into the search box, probably with a local component to make sure they only see photographers who are actually in their community. #5: Are You In The Top 10? This is where the rubber meets the road, as it were, and if you’ve done a good SEO job pages from your website should appear in the top 10 items in the search results, which is page one for the search term the user was looking for. As I already mentioned there are many factors that determine where your web pages will rank in the results, and it’s not just down to keywords anymore. Social sharing, natural links from other websites, user behavior, the length of your content, and many of the metrics from your Google Analytics all count towards your search ranking, along with hundreds of other potential signals and factors. However, the real magic of your SEO happens when your prospect clicks on your link in the search results to bring her to your website, leading to a new photography client. The final step in the process is, of course, to book new clients, allowing you to focus on what you love doing the most, which is creating beautiful photography for the people who value and treasure what you do, and being paid well for it! And that’s really all there is to learning how SEO itself works, at least as far as we need to know to get the best from it. There’s no point in over-complicating things by going into all the deep technical details of how the Google algorithms work (no one outside of Google fully understands that anyway), and now I hope you can see that SEO is really not the complicated and mystical science you perhaps thought it was. Next, I want to make sure you understand the terminology of SEO. Understanding what all this jargon means will also save time in the future, since you won’t have to waste time looking stuff up or wondering what people are talking about. Despite the many changes we’ve seen in the world of SEO, there are still a lot of people who practice some outdated (and ineffective) SEO tactics. While some of these might work in the short term, they can eventually land you in hot water and are best avoided.